Hi from (redacted), where I am in town for a big interview. You'll have to tune in to HBO in November to find out. Situational awareness: Apple is acquiring part of Dialog Semiconductor for $600 million, including $300 million as a pre-payment for chips, as it moves towards designing its own chips. Axios' Dan Primack says it will also be Apple's largest-ever acqui-hire, with over 300 Dialog engineers moving over. Here's a headline many thought they would never see: "Microsoft joins Open Invention Network to help protect Linux and open source." What's more — it's from a Microsoft blog post. Driving the news: The company announced on Wednesday it's joining the Open Invention Network, making its 60,000 patents available to the group's 2,600+ members to help those companies defend against infringement lawsuits. Background: The OIN, for the uninitiated, is a coalition of companies formed in 2005 to help the budding open source movement protect itself from an onslaught of patent attacks. Microsoft, at that time, was among the commercial software companies leading the charge against open source in general, and against Linux in particular. Its founding companies were Google, IBM, NEC, Novell, Philips, Red Hat and Sony. Microsoft's position has changed over the years. Before its warm embrace of open source, Microsoft led the charge against Linux, and later Android. It worked to create a cloud of legal uncertainty, casting both operating systems as likely infringers of Microsoft patents. It later focused on trying to get those selling Linux and Android-based devices to license such patents, generating a healthy stream of revenue — a move that generated hundreds of millions of dollars in revenue. At the same time, Microsoft said those who have been closely watching its evolution will see this as "the next logical step." We know Microsoft’s decision to join OIN may be viewed as surprising to some; it is no secret that there has been friction in the past between Microsoft and the open source community over the issue of patents. Our thought bubble: Yes, Microsoft has been moving in this direction for a while. Still, it’s the fullest possible turn from when then-CEO Steve Ballmer was calling Linux a "cancer" and threatening that any company using it or Linux was infringing on Microsoft patents. 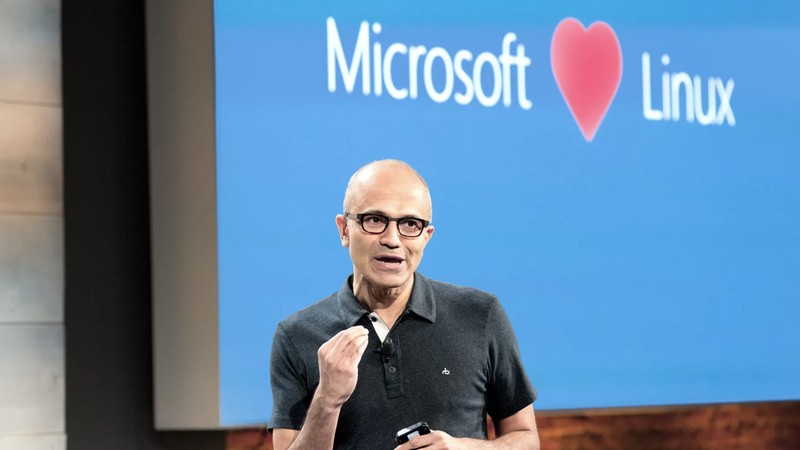 Of note: Microsoft's acquisition of code repository GitHub, announced in June, makes a strong relationship with the open source community even more strategically important to the software giant. Fine point: Microsoft VP and soon-to-be GitHub CEO Nat Friedman notes that Microsoft didn't seek any special treatment, committing all its patents and clicking "accept" on the license agreement just like any other member. "If you're looking for signs that we are serious about being the world's largest open source company, look no further," Friedman says. The Verge's Tom Warren: "Microsoft is going all in on open source. Hell has truly frozen over." Lambda School CEO Austen Allred: "The turnaround of Microsoft openly embracing and advocating for the open source community is something that would blow the mind of fourteen-year-old me." SlideShare co-founder Amit Ranjan: "It's not April Fools Day & this isn't an Onion article either:)"
Meanwhile, in another headline that would have seemed unlikely a decade ago, Microsoft passed Acer to become the No. 5 PC vendor in the U.S. thanks to its Surface line, per research company Gartner. Amazon discovered that an algorithmic recruiter meant to help the company find top talent was systematically biased against women, Reuters reports. Why it matters: This is a textbook example of algorithmic bias, notes Axios' Kaveh Waddell. By learning from and emulating human behavior, a machine ended up as prejudiced as the people it replaced. Details: Amazon's experiment, which dates back to 2014, was trained on 10 years of job applications, most of which came from men, Reuters' Jeffrey Dastin reports. The system concluded that men were better candidates for technical jobs. In 2015, Amazon began to realize that the system was penalizing resumes that included the word "women’s" (as in a women’s sports team or all-women’s colleges). Accenture's Rumman Chowdhury tells Axios that Amazon's results aren't that surprising, pointing to an issue Google had a couple years back. "Algorithms are simply reflecting the patterns they see in the (biased) real world without understanding causal relationships — we’ve all heard 'correlation does not mean causation.' We are running into those issues today with the implicit assumptions being made by algorithms. Data is not an objective truth, it reflects our cultural and social biases." What’s next: Many large companies — including Goldman Sachs and Hilton — already use AI in their recruiting process, and the list will only grow. But companies are still hoping that properly trained AI can not only avoid algorithmic bias but also correct human recruiters’ prejudices. Go deeper: Kaveh has more here. Essential, the smartphone startup run by Android co-founder Andy Rubin, is said to be shaking up its product plans once again. What's new: Bloomberg reports that the struggling electronics company has put its planned second product, a home hub, on the back burner. Instead, it's focusing on a small-screen AI-based phone capable of taking dictation or taking action on its own. It's the latest revamp of the roadmap for Essential. Bloomberg reported in March that Rubin was scrapping plans for a successor to the Essential Phone and was exploring a sale of the company. An Essential representative did not immediately respond to a request for comment. Why it matters: Essential has raised a ton of money with a goal of building a broad-based consumer electronics brand. Its plan was predicated on at least moderate success with its first product, a smartphone. Instead, the phone debuted to weak sales, jeopardizing all its other plans. Our thought bubble: As I cautioned when the first device launched, the smartphone business is a brutally competitive market where ad dollars and manufacturing prowess tend to matter most. Starting with a smartphone, Rubin says, lets Essential kickstart the business by starting with a well understood and huge category. But, in starting there, Essential is diving into a brutally competitive and demanding market, meaning that a lot of energy is going to be going in that direction. Jeff Bezos' Blue Origin beat out Elon Musk's SpaceX for part of a key Defense Department rocket contract. SpaceX has already launched many rockets for the U.S. military, but the win is a first for Blue Origin. Why it matters: It's a coup for Bezos and could serve as a red flag that DOD interest may not be as high in SpaceX's next-generation Big Falcon Rocket, per Axios' Andrew Freedman. Today is National Coming Out Day, so here's a shout out to all our LGBTQI readers, especially those just sharing their story with the world. For those that haven't already abandoned Facebook, the social network just added the ability to mark "came out" as a life event. Square CEO Sarah Friar is leaving the Jack Dorsey-run payments company to become CEO of Nextdoor. Recode's Jason Del Rey said he isn't surprised to see Friar leave for a CEO gig, but is surprised it was Nextdoor that lured her. Meanwhile, Dan notes how big a loss it is for Square, with Dorsey relying heavily on Friar to execute his vision. 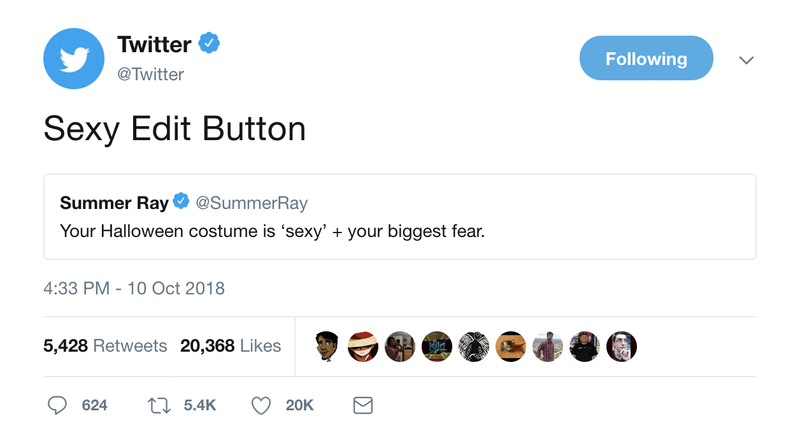 Twitter's Twitter account has been on fire of late, but this tweet was next level.